Abstract: Census and other demographic data are used to estimate the volume of the illegal slave trade to Mauritius and the Seychelles from Madagascar and the East African coast between 1811 and c. 1827. The structure and dynamics of this illicit traffic, as well as governmental attempts to suppress it, are also discussed. 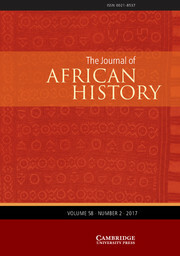 The importation of perhaps as many as 106,500 bondsmen into Mauritius, Reunion and the Seychelles between 1811 and the early 1830s suggests not only that the early 19th-century Malagasy and East African slave trades were far more vigorous than previously supposed, but also that they exerted a greater influence upon the region's political and economic life than some historians have been willing to concede. The illegal trade's significance is underlined by the connection between the date of its demise and Mauritian planters' first attempts to secure indentured labourers from India and elsewhere to work in their fields. Domestic economic considerations, together with British pressure on the trade's sources of supply, contributed to its demise in the late 1820s. Notes, ref., sum.